I just found the old seating planfrom 2008 - ignore red arrow. sure it will be same this time round, won't it? we got A5 row G !!!!!!!!!!!!!!!!! All the indications from Ticketmaster are that the 2012 seating plan is different - see Dublin pre-sale thread. I hope it is anyway as I have bought 2 seats which don't exist on this plan. Several people have been told by Ticketmaster this morning that Kilmainham 2012 will have 7 blocks with A4 at the centre. A3, A4 and A5 should still be very good but I don't want anyone to be misled! Pollydoo, if that's correct I'm dead centre in row 27. I'm sure we will all have a wonderful evening. Last edited by kg7 on Sun Sep 16, 2012 1:53 pm, edited 2 times in total. Glad to hear that, Pollydoo - around 10,000 I think - only half the size of Lissadell? Complained to both Ticketmaster and POD about the absence of a seating chart for early bookers. Polite response fromTicketmaster saying they had to wait for seating chart from Organisers, no response, so far, from Organisers POD. So 10,000 is considered small?? I guess compared to places like MSG or Palau Sant Jordi, which are 30,000 & around 20,0000 respectively - 10,000 might be small. But when I hear "small", I think like 2500 - 3000. So, TipperaryAnn, thank you for clarifying the meaning of "small' in this case (LOL!). Yes, it's all relative. . . So 10,000 is considered small?? Yes, it's all relative. . .
Later edit - Come to think of it, Lissadell was probably 10,000 each night, 20,000 in total, so much the same size as Kilmainham. Does anyone else who was seated in Block A feel aggrieved after last night's concert. Apart from the joy of being in the presence of the great man, I might as well have been at home watching him on DVD! oldideas wrote: Does anyone else who was seated in Block A feel aggrieved after last night's concert. Apart from the joy of being in the presence of the great man, I might as well have been at home watching him on DVD! I guess you were in one of the side blocks, A3, A4 & A5 were great - sorry you didn't get a better view! Ticketmaster were slow to put up a seating plan when tickets went on sale. I wonder if anyone can answer this. I bought a ticket immediately once the presale link became available for last nights show. I selected ticket of price €85.60 Best Available. At the time it wasn't clear from the seating plan where I was but I guessed I had a good seat as I had purchased immediately on presale. When I got there last night I found myself nearly at the very back of A5 section a very long way back from the stage. I couldn't believe it, it was really disappointing. This can't have been right can it? What areas were the 94.60 and 105.60 tickets? Bingo wrote: I wonder if anyone can answer this. Sorry you were disappointed with your seats Bingo. It really pays to have a valid seating plan to hand when you're ordering tickets. If I recall correctly, Ticketmaster were slow to get one up for this presale (I used Polydoo's posted above in this thread). 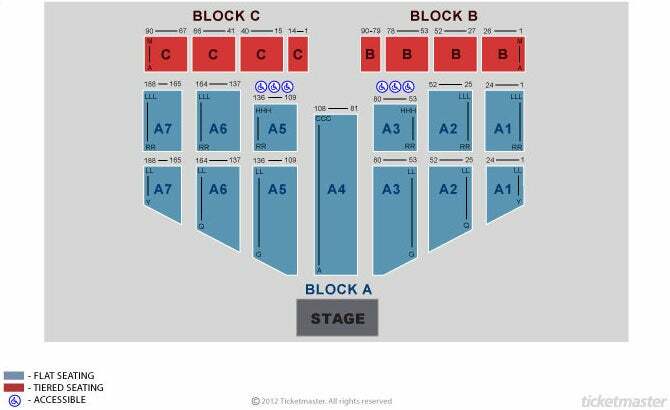 I paid 105.60 and got block A4 row AA (dead centre approx 27 rows back). I actually had better seats a few rows further forward a couple of times and released them to try again but kept moving back so purchased. Even if you have a valid seat plan, unless you know the venue from experience, it can still be a bit of a lottery. I once purchased what looked like great seats at The Marquee in Cork only to end up in a seat with restricted view from the side and ended up abandoning them and standing at the front for the night (to be fair, the promoter Jim Aiken gave me a partial refund on that occasion). I know from experience that presale seats are restricted - they can only sell a certain amount of good seats in the presale. Several times at presales in the 02 for example, I have not purchased and managed to get better seats in the general release next day! Hope this helps you next time! Last edited by kg7 on Sun Sep 16, 2012 10:59 pm, edited 1 time in total. Thanks kg7 for that info, that's very helpful.